Hello from Team 9! 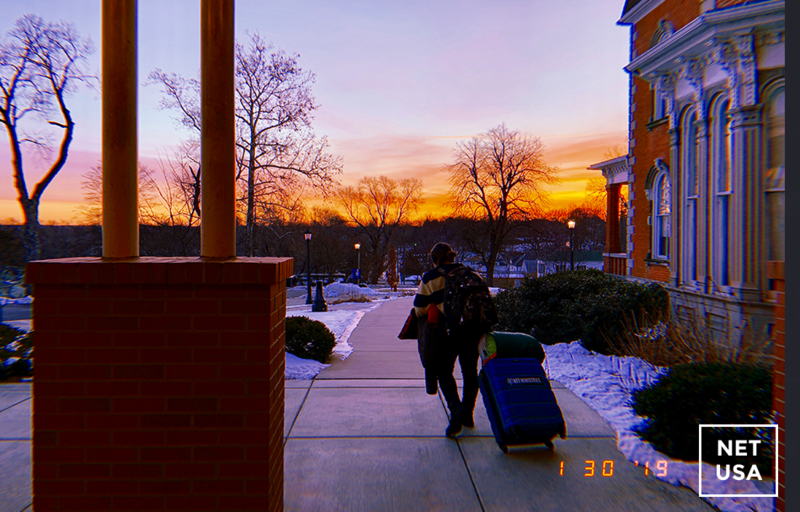 Since getting back on the road on January 9th, we’ve been braving the cold, snow, and ice in the Archdiocese of Kansas City, Kansas with a packed schedule of retreats and even a recruitment event at Benedictine College in Atchison, Kansas. Life as a missionary is not a stroll in the park, but it is a life that reflects true beauty and faith. There have been many moments that the Holy Spirit has worked through us to show other people how much God truly loves them. For instance, before getting back on the road, the team had the opportunity to go to a laundromat. While waiting for the laundry to finish up, a couple of the men on our team started a conversation with an older man and began to talk to him about how God has worked in their lives. After a lengthy conversation, the men on our team asked the older man if they could pray with him. Seeing a group of men bowing their heads and praying together with such devotion and love was such a powerful witness of how God works through simple people to show extraordinary things. Every day on the road is a brand new adventure and rarely do two days look the same, but we’d like to invite you into a day-in-our-lives! One thing that is a constant for us as NET missionaries is that we start our days with a time of personal prayer. We are blessed with the opportunity to have at least 30 minutes to pray by ourselves each day; this may include a time of personal praise and worship, reading the daily Mass readings, praying the Rosary, or writing in a prayer journal. Each person on the team has their own special way to pray and the options are endless. As each person grows closer to God in their personal lives, the team unites and the relationships between each teammate begin to strengthen. In other words, placing God in the center of all your relationships is a two-for-one deal. After starting our day with prayer, we go eat breakfast with our host family. Being able to stay in host homes is a true blessing to us because the host families are so selfless in the way they serve us. They give all they have to us and it’s a beautiful witness of true generosity. Soon after, we as a team get into our 15-passenger van and head to the church or school for the retreat that we will put on that day or later in the evening. When we arrive, the team leaders will go meet with the Retreat Contact Person and the rest of the team will sit in the van, intercede for the meeting, and await further instruction about the day that is ahead. Once instructions are given, we usually set up for the retreat and then head to the parish chapel, church, or an open room to do team prayer. Praying as a team is a beautiful way that we grow closer to God and to one another. After team prayer and a few hours of ministry prep (time to work on talks, testimonies, dramas, skits, etc. ), it’s time for the retreat. A retreat can last anywhere from three to twelve hours and each retreat is unique and full of God’s love. We are thrilled to be able to continue this ministry for the next three months and to continue witnessing the way God works in and through us when we are open to the Holy Spirit.